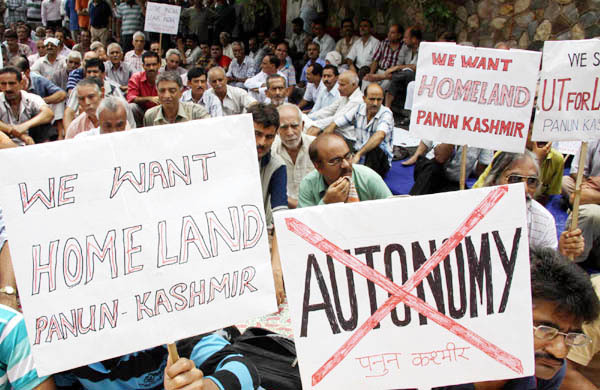 ambasting the Government of India's eagerness to concede all the demands, be it granting of Autonomy, dilution of AFSPA, withdrawal of Security forces, job bonanza for stone pelters and Ex-militants, Panun Kashmir has said that it clearly demonstrates that the government of the present day has abandoned Kashmiri Pandits, People of Jammu and Ladakh. 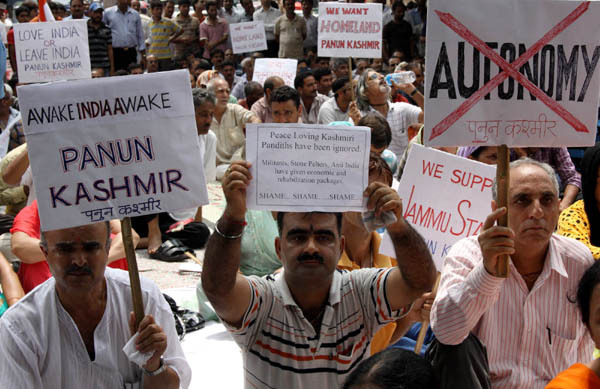 Addressing the rally organized here on Wednesday- Dr. Agnishekhar deplored the GOI's attitude of only recognizing and nurturing the muslim sphere of interest in J&K state; thereby endangering the integrity and secular polity of India. He said that the political class of this nation is encouraging pseudo-secularists, champions of civil liberties, biased Human Rights activists, and people of sub-nationalistic tendencies to force second partition on this nation. 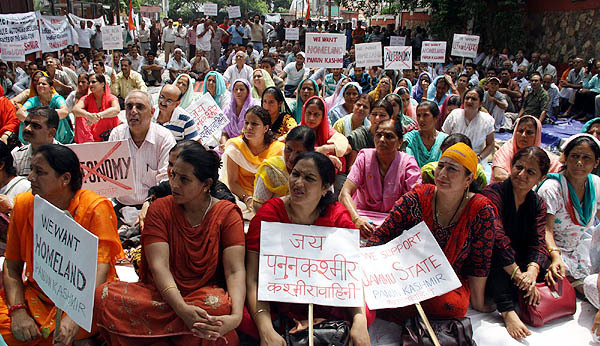 He said that his party rejects the PM's offer of granting of Autonomy to the J&K state, adding that Kashmiri Pandits being the prime stakeholders and sufferers of continuous genocide, exclusion demand establishment of Separate Homeland for over seven Lakh Kashmiri Pandits in Kashmir Valley with Union Territory status, who are presently living in exile in Jammu and elsewhere. 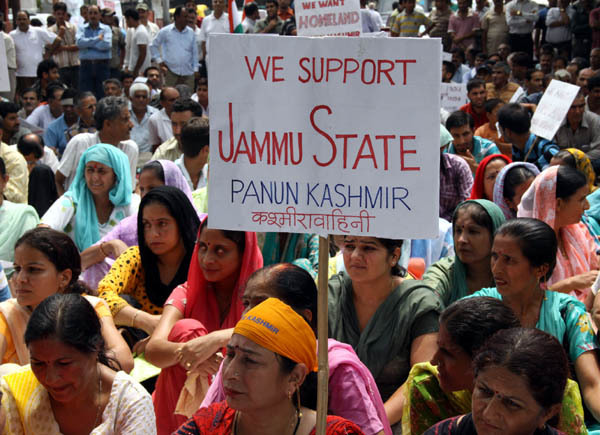 While addressing the gathering, he assured the people of Jammu and Ladakh of unflinching support of Kashmir Pandits in their struggle for achieving statehood for Jammu and Union Territory status for Ladakh. He released the calendar for a series of protest demonstrations by Kashmiri Pandits nationally to create awareness among the people of India regarding dangers emanating from the granting of autonomy to J&K which will endanger the integrity and sovereignty of the nation and to garner support for quadrification of J&K state fulfilling the geo-political aspirations of all sections of the state who have been victims of discrimination and neglect and apathy since 1947 at the hands of Kashmiri Muslim polity. 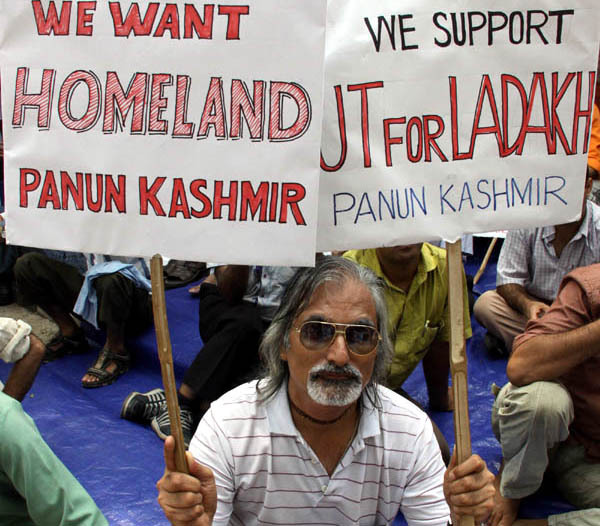 He informed that the protest rallies will be held at Chandigarh, Panchukala, Palampur, Delhi, Faridabad, Noida, Jaipur, Bhopal, Indore, Ahmedabad, Vadodra, and Mumbai will raise their demand in strong voice for creation of Homeland in Kashmir Valley with Union Territory for over seven Lakh Kashmir Pandits; statehood for Jammu and creation of U.T for Ladakh and will culminate on 14 september on martyrs day at jammu. Appreciating the efforts of Panun Kashmir, Prof Virender Gupta, President Jammu State Morcha emphasized over reorganization of Jammu and Kashmir state. He said that it was the only solution to save integrity of India and fulfill the aspirations of all sections of state, which have been discriminated since 1947. 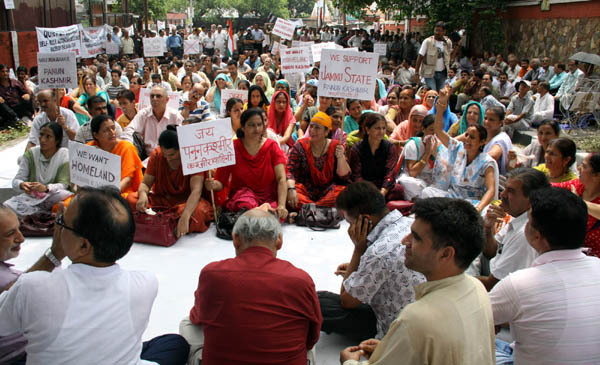 Justice Pavitra Singh chairman JPF appealed to all sections of Jammu and Kashmiri Pandits to unite in this hour of crisis to defeat the evil designs of anti-national forces. President Duggar Pradesh Party Udhay Chand made pointed reference to growing Pan-Islamic crusade knocking on the doors of Nation. 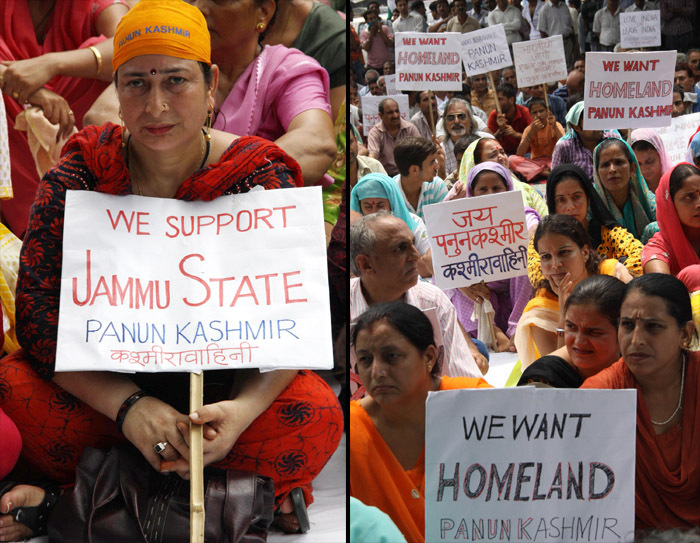 He appealed people of Jammu, Kashmiri Pandits and people of Ladakh to work unitedly for achieving desired objectives. 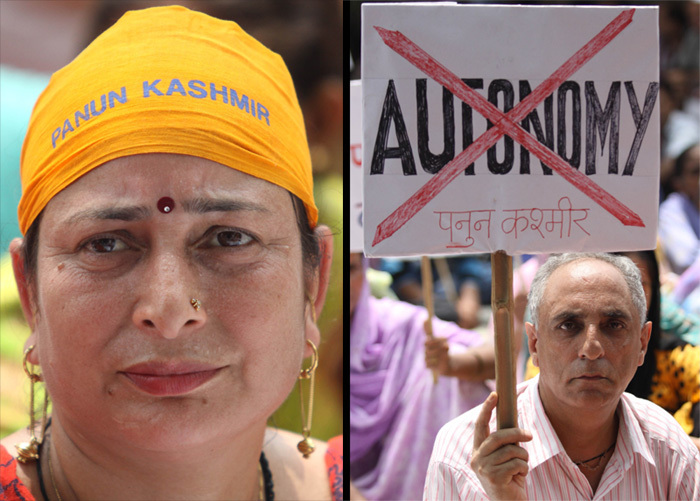 Dr. Khema Kaul national spokesman of Kashmira Vahini appealed the conscience of Jammu and women in particular to see and act against nefarious designs of forces inimical to unity and integrity of Nation. S.K.Khabri senior activist of Panun Kashmir lambasted the state government for acting in a partisan manner since 1947 and implemented agenda of Muslim precedence. 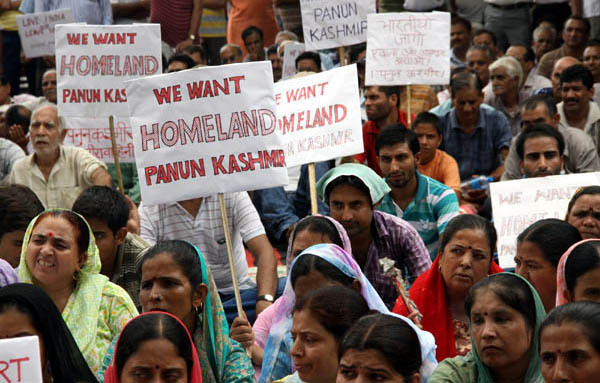 P.L.Badgami a prominent Kashmiri Pandit leader while addressing the gathering said that the constitutional machinery has broken down and creation of Homeland for Kashmiri Pandits is only viable option. Other speakers who spoke on the occasion were Pratap Singh Jamwal vice President JJSF, Mahesh Kaul President Sangarsh, Rajesh Kesari senior member JPF. Good to see so many participate in this event organized by PK.